The world known as Salt was once home to a peaceful, prosperous people. It was a world populated by musicians and poets, great thinkers and dreamers. Until one day, a dark oppressive force plunged Salt into ruin. Thus begins the tale of Dandara, a remarkable 2D platformer that is unlike any game I have ever experienced. I honestly did not know what to expect when I sat down to play Dandara for the first time, other than the exploratory structure of the classic ‘metroidvania’ formula. And yes, it does fulfill the necessary requirements of that often overused, yet incredibly accurate descriptor: a free-to-explore map with access to new or previously inaccessible areas guarded by either gaining of new abilities or overcoming an obstacle. 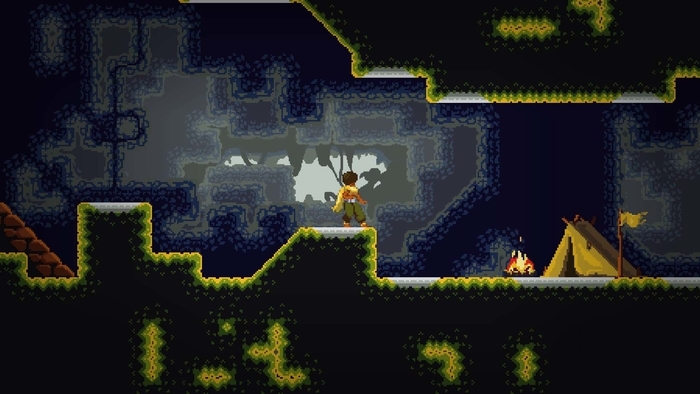 But where Dandara differs from the very games it draws inspiration from lies in how it handles movement. Tradition dictates that you, the player, use the directional pad to move about the character on a 2D plane. Dandara ditches the convention entirely and instead opts to relegate movement through jumping and clinging to surfaces around you. When Dandara jumps to a surface, you are able to aim where she can jump to next with the analog stick. Most of the time you are confined to a 180 ° radius of where you can aim Dandara but if you injured and knocked off of a surface, you are given a full 360 ° radius to move freely and regather yourself. While it might sound limiting at first, and even a tad frustrating (what do you mean I can’t just walk?! ), I have never felt such a sense of freedom of movement in a game. Watching Dandara’s gravity defying antics is an absolute marvel to be a part of, made all the more satisfying as you get a better handle of the control scheme. Admittedly, it did take me some getting used to but once I get the hang of Dandara’s movement, I could not help but smile. It was as if Dandara and I were locked in a dance, an elegant ballet, and the world of Salt was our stage. And the same could be said about the game’s combat mechanics. 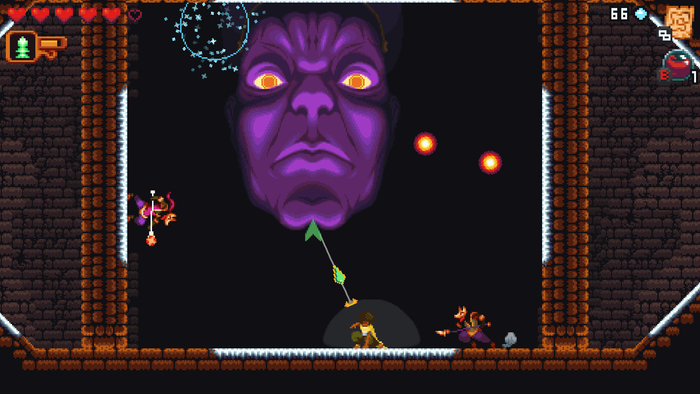 Any ‘metroidvania’ title worth its salt…(I’ll see myself out) features a decent amount of combat. Fortunately, Dandara is not only packed with a wide variety of too-cute-to-kill enemy sprites, it also features an assortment of weapons and abilities to make all that inevitable killing fun. Aside from your standard blaster (which can fire in after you charge it for a short period of time) Dandara eventually gains access to green-colored missiles that pulverize stone barriers and deal massive amounts of damage (just like Metroid!! ), purple projectiles which ricochet off of surfaces to get to those almost but no quite out-of-reach enemies, and even a defensive shield to guard against oncoming attacks. Your weapons and abilities coupled with the slick and precise movement mechanics, make for intense moment-to-moment gameplay. The enemy placement and layout of the world constantly keep you on yours toes: one moment you’ll be able to observe a situation and execute an attack slowly and methodically and other times you will be frantically jumping, shooting, and then retreating while formulating a plan on the fly. 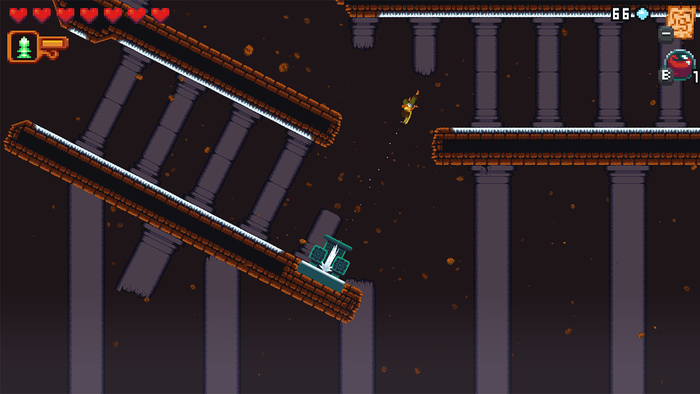 And it’s all due to Dandara’s most notable achievement – its level design. Dandara’s breathtaking visuals do the ‘metroidvania’ label justice. As a HUGE fan of retro graphics, I completely fell in love with the artistic design and the well-thought out placement of platforms. Each room can often feel like a small puzzle as getting from Point A to Point B is never as obvious as it seems. The game starts off very subtle but eventually the environment itself takes part in how you navigate around the room. From physics-based platforms and alters that can extend Dandara’s jumping reach, it is clear that the developer put a lot of thought and attention to the massive world. While the 8-Bit era undoubtedly played a factor in Dandara’s design there is an…inescapable…(ugh, and I really hate to make this comparison because it’s lazy but here I am doing it anyway) Dark Souls influence at play here. In an interview with Long Hat House (which can be listened to here) the team acknowledged the elements it borrowed from From Software’s wildly successful Dark Souls series and thankfully it turns out to be more than I initially anticipated. Scattered throughout the world of Salt are campsites (bonfires) where Dandara can rest and use her accumulated essence (souls) to upgrade her base stats and skills such as maximum health, the potency of her health vials (Estus Flask), and so on. Campsites also act as a respawn point when you die…and you will die…a lot. When you die or meet ‘oblivion’ as the game puts (so dramatic), you leave a ghostly echo of yourself in the spot where you met your demise along with all the souls you’ve gathered – I mean essence, SORRY! If you are able to reach your floating phantasmal form, you regain all the essence you lost – no harm, no foul. I get this. Countless of other games have done it. It isn’t anything new. But what I wasn’t expecting these borrowed mechanics to do was play into to Dandara’s overall world-building and help shape the narrative that is compelling you to move forward. There is a painfully real and haunting aspect to Dandara I honestly was not expecting. Whenever you reclaim your spirit after you die, a text prompt appears which simply states “Dandara – Serious Injuries” referencing how you met your end. Throughout the world of Salt you will encounter the souls of its dead citizens…and the game does not pull any emotional punches when it describes how they met their tragic fate. One soul I discovered early on revealed that the individual I came across had died of sadness. And that just hit me in a way that I wasn’t really prepared for, that I had to take a moment to take that in. 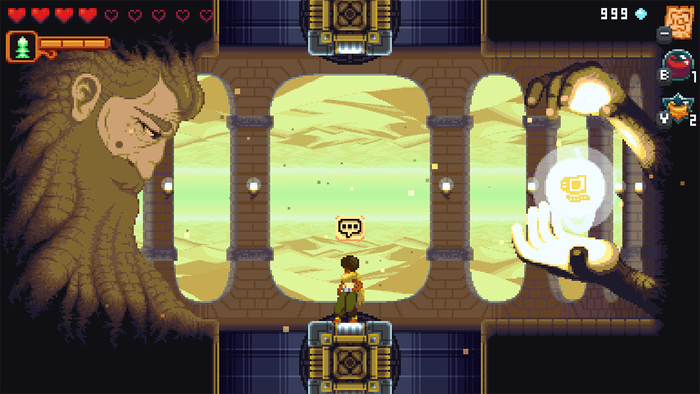 It lends a certain authenticity to Dandara, an element that a lot of modern big-budget titles tend to overlook. In terms of negatives, there isn’t much I encountered that marred the overall experience. The map system could be better as I often felt it was working more against me that it was for me. Defying gravity comes with sudden perspective changes, as the rooms you occupy shift and rotate to accommodate your movement. The only issue is that while the room shifts, the map remains static so referencing it was more of a head-scratcher than anything else. Another gripe I have is with the button-layout. Why…oh why..do developers insist on mapping ‘jump’ and ‘shoot’ to anything but ‘B’ and ‘A’, respectively. As a classically trained gamer, that layout is embedded deep into my muscle memory. It does me no good when I’m scrambling in an intense shootout and I accidentally use a health vial when I intended to shoot. And if you are hellbent on mapping the buttons in your own weird way, please…PLEASE give me the option to remap it myself. Okay, rant over. Moving on. Dandara has a lot of heart and you can see it coded into every single pixel. It is clear that Long Hat House put a lot of love into Dandara and the labor of that love is more than obvious. It is an experience I won’t soon forget and I encourage you to not let Dandara slip passed you. It won’t offer much in terms of replayability, but at the price of $11.99, it doesn’t need to. What you have is a beautifully crafted title with the gameplay and soundtrack to make it one of the most unforgettable indie games of the year. Nintendo Switch Review Code for Dandara provided to Proven Gamer courtesy of publisher Raw Fury. I caught a glimpse of this game in the Playstation Store and was looking for more information on it. Makes sense to borrow the bonfires feature from Dark Souls. It’s a great game mechanic. Overall, now I’m looking forward to giving the game a try. Thanks for the excellent review!